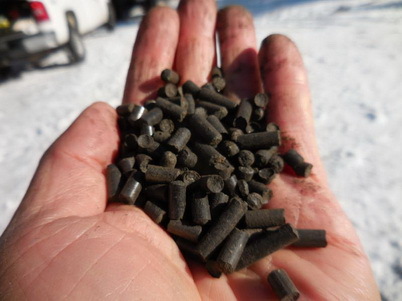 Close-up of pelletized biochar. U.S. Department of Agriculture Forest Service. Snapshot : Biochar can be used to restore forest, range, or mine soils by adding organic matter, providing buffer from droughts or floods by increasing water holding capacity, and sequester carbon. Forest Service scientists and their partners developed and tested a high-capacity biochar spreader to reduce the cost and facilitate the application. Biochar can be used to restore forest, range, or mine soils by adding organic matter, providing buffer from droughts or floods by increasing water holding capacity, and sequester carbon. One major barrier to producing and using biochar has been the lack of an appropriate method for distributing the char. Applying biochar to forest sites can be problematic and costly because of the need to keep the forest floor as undisturbed as possible during and after harvest operations. Application by hand is also difficult and dusty. Forest Service researchers at the agency’s Rocky Mountain Research Station and Missoula Technology and Development Center, and their partners at Washington State University and John Jump Trucking, Inc., developed and tested a high-capacity biochar spreader to reduce the cost and facilitate the application of biochar as a soil amendment. The spreader can be mounted on a log forwarder and used on skid trails and log landings to distribute either pelleted or bulk biochar. This spreader can be modified to carry a variety of payloads and adjusted to apply biochar at many different spread rates. In field trials, the researchers detected no change in soil bulk density when using the spreader on sites with an intact forest floor. Compaction increased by 11 percent from forwarder ground pressure when the spreader was used on a flat area with no forest floor; however, biochar applied to forest sites adds organic matter and helps to retain water, thereby potentially resulting in a decrease in soil bulk density over time. The researchers and their partners developed and tested a high-capacity biochar spreader and were able to modify a log forwarder to accommodate the spreader. The spreader works with bulk or pelletized biochar. The spreader performs equally well on flat or steep ground. The spreader should be used where the forest floor is intact. Application of biochar using the spreader does not negatively impact soil physical properties when used properly. Kevin Jump, John Jump Trucking Inc.